Grape Creek ISD Board of Trustees: Mike Diaz, trustee; Becky Buck, secretary; Jimmy Hill, trustee; Diane James, president; Fred Contreras, vice president; Scott Stephens, trustee; Kacey Doucet, trustee; and Angie Smetana, superintendent. Mike Diaz, Scott Stephens and Kacey Doucet ran unopposed in the General Election for full four-year terms. All will be sworn into office at the June 10, 2019 board meeting. Becky Buck, Fred Contreras, Diane James and Jimmy Hill ran unopposed in the General Election for full four-year terms. Kacey Doucet was elected for the unexpired four-year term left vacant by Scott Smetana with two years remaining on the term. All will be sworn into office at the June board meeting. Tom Walker, current board president, chose not to run for re-election. 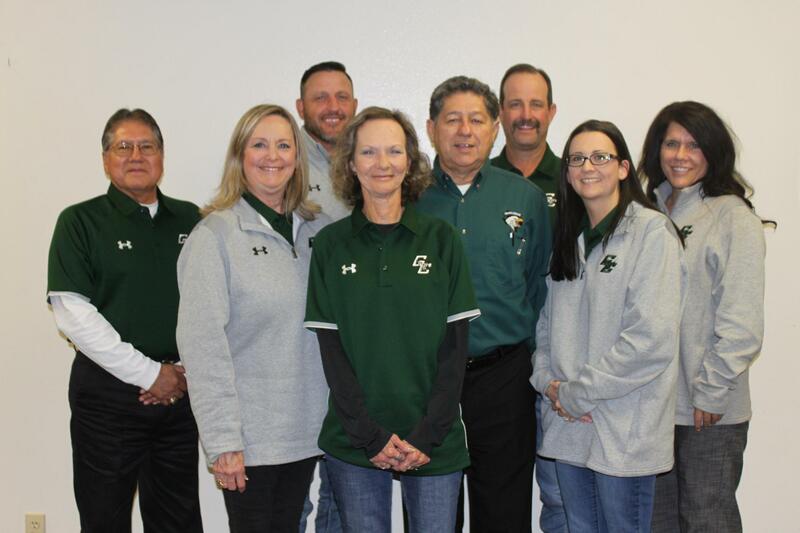 The Grape Creek ISD Board of Education meets at 6:30 p.m. the second Monday of each month in the community room at the Administration Building, 8207 U.S. Hwy. 87 North. Our board members serve 4-year terms and elections are held in May on odd-numbered years. The terms of Mike Diaz, Scott Stephens and Kacey Doucet will expire in May 2019. The terms of Becky Buck, Fred Contreras, Diane James and Jimmy Hill will expire in May 2021. The public is always invited to board meetings. Audience participation at a board meeting is limited to the public comment portion of the regular meeting. Persons who wish to make comments to the board shall sign up before the regular meeting begins, indicating the topic about which they wish to speak. Public comment is reserved for regular monthly meetings and not called or special meetings. Regular meetings, special called meetings or public hearings are posted on the front door of the administration building at 8207 U.S. Hwy. 87 North. Grape Creek ISD adopted a tax rate that will raise more taxes for maintenance and operation than last year's tax rate.